MAXBEAR is a brand focusing on cell phone battery , We aim at supplying high quality professional Battery products，We are not perfect but never stop upgrading ourselves to supply perfect products and services to our customers. 3500mAh High Quality MAXBEAR LG G5 Battery x 1 pcs. ---If for any reason you are unhappy with any product by MAXBEAR please do not hesitate to contact us. We take full ownership and responsibility for the quality of our products and will do our very best to solve your problem quickly and efficiently! [ Ease of use ]: Easy installation, the same size as your original battery LG G5, better high-capacity backup battery for your smartphone, and you can easily add or delete. 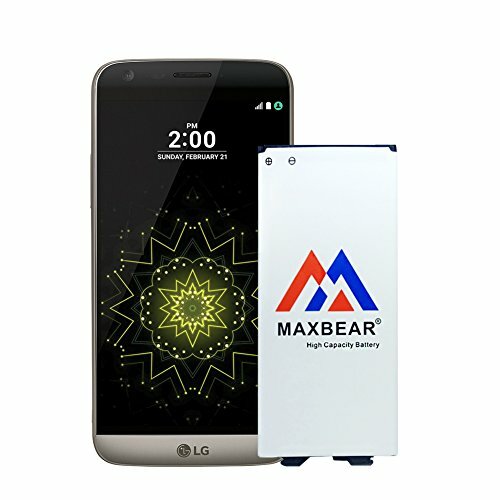 [Grade A + Battery ]: MAXBEAR Replacement Battery for LG G5 uses Grade A+ rated battery cells with CE and ROHS certification. Each battery comes with a special chip to protect your smart phone from over-heating, short-circuit, over charging or over discharging. Each Replacement Battery for LG G5 battery is designed to last over 600 repeated battery charge cycles. [ Compatible Models ]:For LG G5 BL-42D1F, H820 (AT&T) ,VS987 (Verizon) ,LS992 (Sprint),H830 (T-Mobile)),US992 (US Cellular). [ Releaseyour Power ]: When using the MAXBEAR LG G5 Battery ,Please use the original charger charging and remember that its full performance and longevity is only achieved after 3 to 5 complete charge and discharge cycles, thus the battery can be reached the optimum effect of using. [ Customer Protection ]: 12 Month Warranty for customer satisfaction guaranteed, Pls contact us if you have any questions. Customer satisfaction is our highest priority. If you have any questions about this product by MAXBEAR, contact us by completing and submitting the form below. If you are looking for a specif part number, please include it with your message.